Believe it or not, seasonal allergy symptoms can be substantially reduced by making dietary changes. 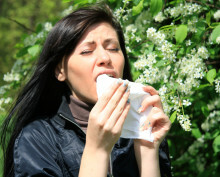 Do allergies hit you every fall and spring? If so, you perhaps have faced a no-win situation with traditional antihistamines, often described as “non-drowsy” allergy medications: Either you sneeze and itch your way through seasonal allergies, or you take antihistamines and live in a fog for a few days. Our own everyday lives can disrupt our sleep. Common sleep stealers include traveling across time zones, environmental factors, chronic pain, illnesses and the medications used to treat them, and even retirement can rob of us restful sleep. For these problems, a few simple steps can restore restful sleep. When summer’s hot, sticky days give way to the cool, crisp air of autumn, the refreshing weather should offer relief from your allergies, right? Unfortunately, not. Fall allergies are a thing, and they could be the reason you can’t stop sneezing. Plenty of other factors can disrupt sleep. Traveling across time zones, environmental factors, chronic pain, the effects of illnesses and the medications used to treat them, and even taking it easy in your retirement are some of them. In many cases, simple steps can help restore restful sleep.